Maria Parepalo began writing professionally in 2006 and has published in medical journals as well as online. She graduated with a bachelor‚Äôs degree in laboratory sciences from Helsinki Polytechnic in 2002 and is currently working on her doctoral degree in cell and molecular biology. Mahi-mahi, also called dolphinfish, is a fairly oily fish with a firm and meaty texture. You can use several techniques to cook it on a stove, oven or on the grill. 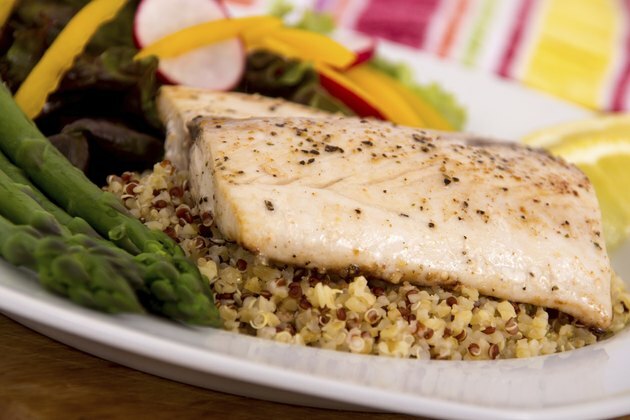 When using the stove, you can pan-grill or sauteed mahi-mahi fillets or steaks. Pan-grilling is an ideal cooking method for fish that has its skin but also for fish steaks and fillets. You use high heat with no fat or liquid and thus it is most suitable for oily fish. Sauteing is done using butter or oil that is in contact with one side of a breaded fish throughout the cooking. Sauteing is ideal for fillets that tend to dry when roasted or broiled. Heat a large nonstick skillet over medium-high heat for three minutes. Brush mahi-mahi fillets or steaks with olive or vegetable oil. Place the brushed fish in the skillet and cook for four to five minutes. Sprinkle the fish fillet with salt and lemon pepper to taste. Turn the fish and cook for five minutes or more until fish is done. Serve on a bed of rice with a white wine sauce or use for fish tacos or a salad. Mix in a bowl 1 cup of flour, 1 tsp salt and 1 tsp black pepper. Wash and pat dry mahi-mahi fillets that are less than 1/2-inch thick and coat with the flour mixture. Shake off excess flour. Heat a large nonstick skillet over medium heat for three to four minutes. Heat 4 tbsp butter, olive oil or a combination of each. Add the coated fillets into the skillets without overlapping. Increase heat to high and saute about three minutes or until the bottom of the fish is browned. Shake the pan from time to time throughout the sauteing. Turn the fillets and brown the other side for two to five minutes until fish is done. Garnish with minced fresh parsley and lemon wedges. Serve with baked potato, steamed vegetables or on a bed of rice. To avoid overcooking your fish, insert instant-read thermometer to the thickest part of the fish. All fish is cooked at 137 degrees Fahrenheit. However cooking fish to 135 F provides more moisture and translucence, according to the “Joy of Cooking”.